The Stanford Women’s Volleyball team is having a great season. If they continue on the path they are, they should have a great post-season. Four of the starting freshmen from the 2016 National Championship team (Jenna Gray, Kathryn Plummer, Audriana Fitzmorris, and Morgan Hentz) are now juniors and continue as starters for this 2018 team. The team seems focused on getting back to the Championship. Last year, they came close, but there was a disappointing loss in the semi-finals to Florida. These exceptional team statistics exist because of some phenomenal individual performances, including Jenna Gray who has the highest number of assists per set, (12.50) and Tami Alade, who has the highest number of blocks per set, (1.67). Also worth noting, Kathryn Plummer (the National Freshman of the year in 2016 and the National Player of the year in 2017) has the sixth highest number of kills per set (4.87). On most other teams, I imagine that most of the offense would be going through her and she would easily have the most kills per set. It’s a tribute to her unselfishness and a reasonably balanced approach to offense for Stanford. While Morgan Hentz, the libero, comes in at number 45 in digs/set, the digs she does make are remarkable, perhaps unmakeable by most liberos. On another team (perhaps one that didn’t block so well), she, too, could very well be the national leader. Currently, Stanford is 20-1 and is the number two ranked team in the country behind the only team that has beaten them, Brigham Young University (in five sets during pre-season play). In twelve matches of conference play, Stanford has only lost four sets. One of those sets lost was the first set of their game at the University of Oregon on October 21, 2018. I wanted to take some time to analyze that set through the lens of rotations. One of the things a coach is trying to do is to place their players on the court in such a way so that as the teams rotate, you can score points by exploiting weaknesses on the other side of the net. At the same time you want to avoid weak rotations, “weak” defined as rotations where your team doesn’t score when it serves or loses points when the other teams is serving. Neither coach knows how the other team will line up before the game begins (unless that team has a predictable pattern) and so it’s a guessing game. Play A | A ball ruled down on an excellent dig by Hentz was challenged successfully by Stanford and the point played over. Play 1 | Raskie serves to Hentz. Gray sets to McClure who hits hard off the block, Oregon has to scramble but Van Sickle (attacking left side) finds a gap in the block and scores. This was a good start for the Oregon team. McClure’s hit went really deep and the Oregon libero had to go far to chase it down. 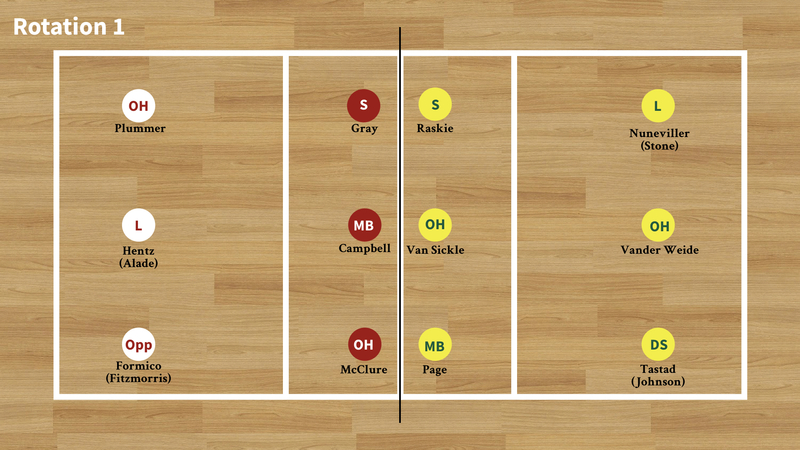 Raskie, the setter, put up a high ball up near the net and Van Sickle found the floor. Play 2 | Raskie serves to McClure who passes to Gray and sets to Campbell on the slide. The Oregon Libero can’t handle it. Play 3 | McClure serves Nunneviller. Ultimately, Campbell pushes a well-placed ball into the back corner for a kill of finesse. Play 4 | McClure service error. The goal in volleyball is to win a point. And to do that 25 times so that you win a set. And then to win two more sets. With some sports, a big play can affect the score significantly. For example, when the bases are loaded in baseball, a home run can be a sea change. Similarly, when the bases are loaded with two outs but an outfielder makes a leap at the wall and catches the ball, that team averts a potential sea change and goes immediately from back on its heals to back on offense (or victory). Volleyball has no big plays. Some plays are impressive, hard fought, lucky, etc. But every play, regardless of how it was earned is just one point. This makes volleyball a momentum sport. You never find yourself suddenly in trouble (down points) on one play. If you’re in trouble as team, a series of plays got you there and it’s going to take a series of plays to get you out of it. One huge kill is just one point. 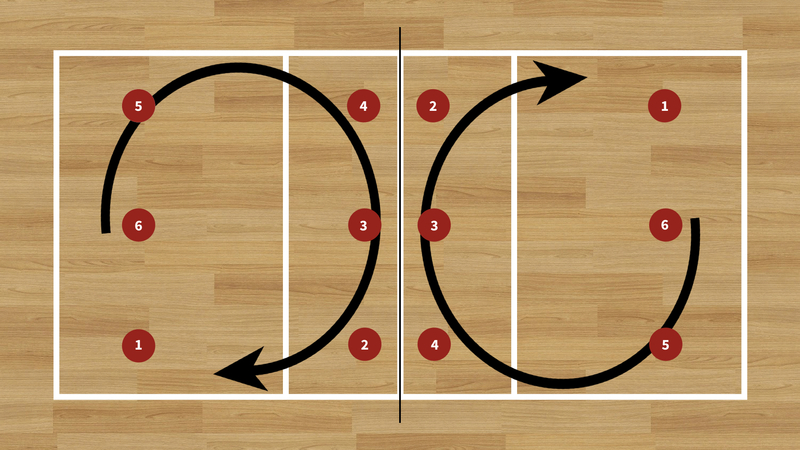 If you’re down in the score, you need to string together some points, which isn’t easy. Similarly, it’s hard to get an advantage. There isn’t one play where, when executed successfully, your team now finds itself up significantly. All this to say, these opening two serves by McClure, produced an acceptable result: Stanford scored a point and then lost a point. Stanford stresses good serving to force some disruption on the other side. The downside is that Stanford has quite a few service errors. These are considered acceptable, though, because even good serving doesn’t normally result in a point for your team. Play 5 | Van Sickle serves McClure. Plummer gets the kill. This is exactly what you want to see happen. 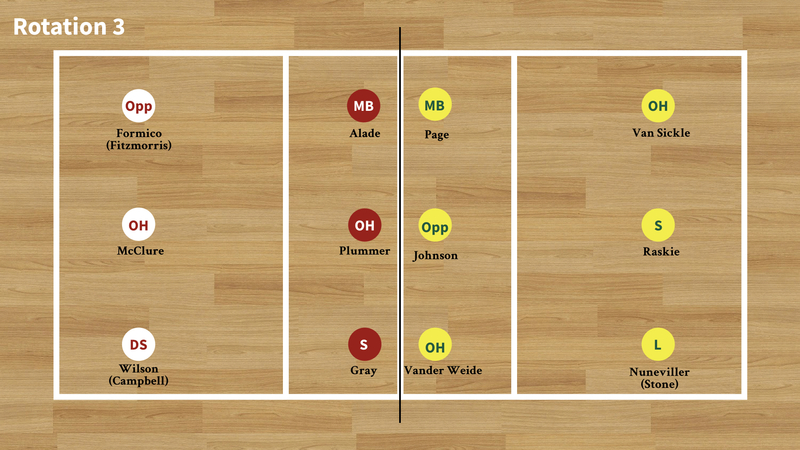 The other team serves and you score a point on their serve—side out. If you do this routinely and once in a while score on your own serve you will win games and matches. Play 6 | Wilson serves Vander Weide. Van Sickle scores from the back row. Van Sickle scored the first two kills for Oregon. What is remarkable about her is that she is 5’9″. She would be among the shortest players on the Stanford side (who are also 5’9″, none of whom are attackers). Play 7 | Nunneviller serves Hentz. It’s a scrambly play on both sides which ends when Stone’s attempt at an angled shot goes wide. Play 8 | This was one of the best-crafted plays of the game, perhaps the match. Van Sickle takes the serve and delivers a spot-on pass to Raskie. 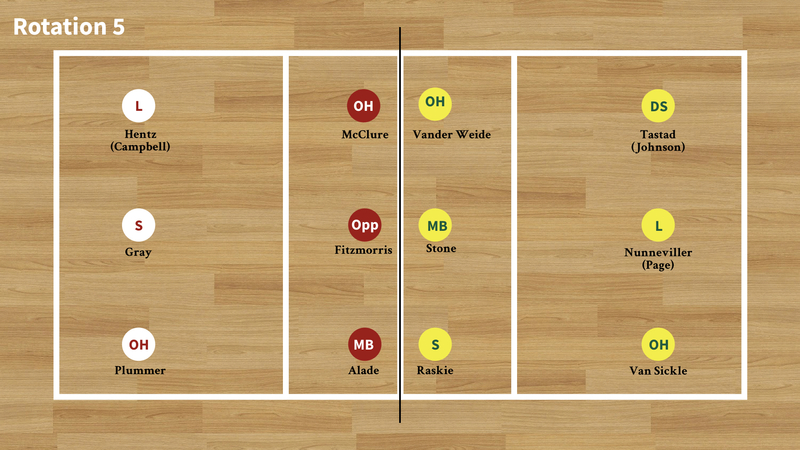 Raskie, because of her “back row” status in this rotation can’t attack, but she has three big hitters up front. Vander Weide is out left. Stone goes out to the right for a slide. The ball goes to Willow Johnson straight up the middle who absolutely crushes it. This is worth watching as plays like this make volleyball an absolutely elegant sport. It seems to me there are several layers of deception going on here. Raskie lines up in the front row and appears to be a front row player, which could be confusing. Willow Johnson, appears to a back-row attacker at this point as she is lined up pretty far back. In choosing to start her attack from the back row, Johnson has many angles to choose from. Almost like a football play, she and Stone run routes across each other. 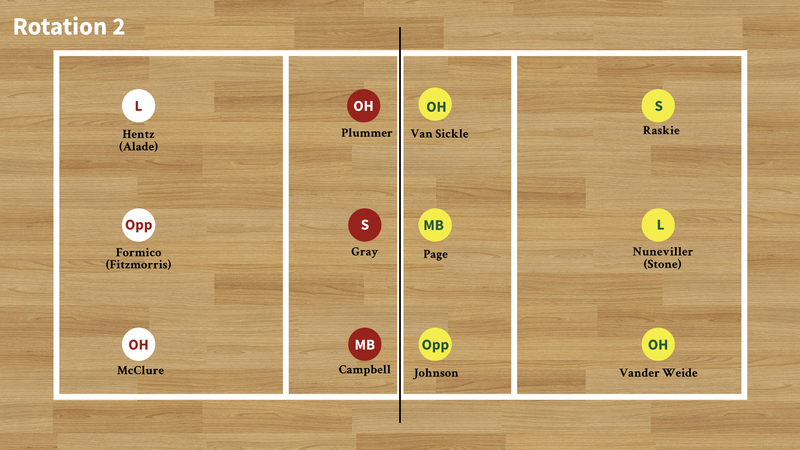 On the Stanford side, how do you line up against these three attackers, not knowing who is going to get the ball? Stone is a great player and Plummer takes her. 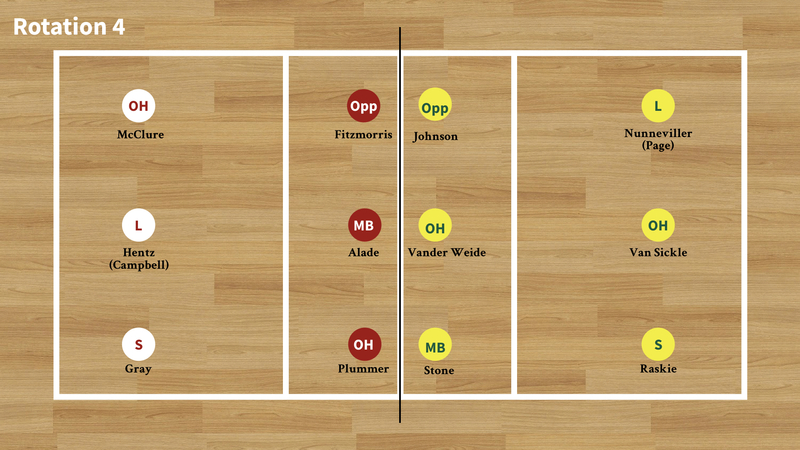 Vander Weide, another strong attacker, grabs Fitzmorris’ attention. This leaves Alade in the middle by herself. By the time Fitzmorris can attempt to close the block, the damage is done. A fantastic play by Oregon, but still just one point. The score is tied. Play 9 | Hentz receives the serve. Stanford loses a joust. Play 10 | Plummer takes the serve. Oregon gets a kill. Play 11 | Plummer takes the serve. Fitzmorris, lined up on the left side for this rotation (normally she is, as the Opposite, over on the right), gets a beautiful kill on a cross-court shot. Nunneviller, the Oregon libero, gets her arms on it, but the angle isn’t right and the ball flies into the crowd. Here was the first breakdown on the Stanford side. Oregon scores two points off their serve before Stanford gets the ball back. This is exactly what you don’t want to see. Play 12 | A good Stanford block falls for a point. Play 13 | Oregon’s Lindsey Vander Weide hits an amazing angled shot. The shot threads a needle: it avoids the middle blocker, Alade, and finds floor space between McClure and Hentz, no easy task. 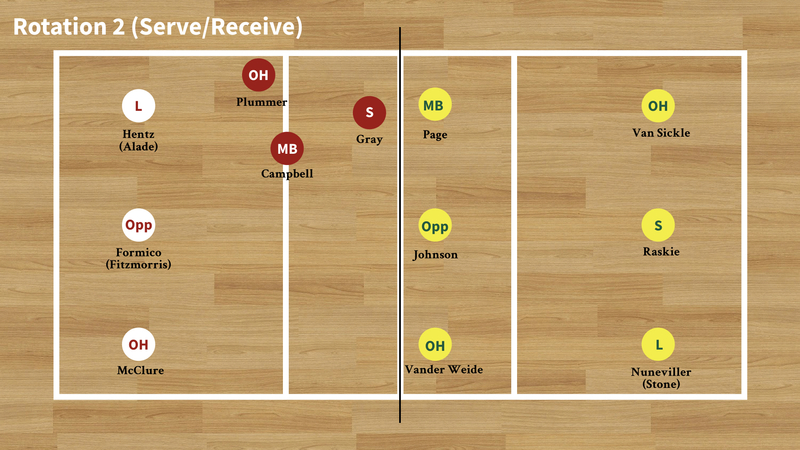 Even though Oregon had this great shot, the end result was that this was another good serve rotation for Stanford. They didn’t score two points like Oregon had just done, but going even (win one, lose one) is, as I said before, perfectly acceptable. Play 14 | Plummer takes the ball and the set goes to Fitzmorris for the kill. Play 15 | A good serve by Hentz. Raskie has to crouch to get to the pass but sets a good enough ball for Van Sickle to kill. Play 16 | Hentz makes a diving stab to save this from being an ace. Somehow the ball gets to Gray to set. Unfortunately Fitzmorris’ cross-court goes just wide. Oregon dodged a bullet on this shot, as this shot was close. Play 17 | A really unfortunate play for Stanford. McClure’s spike hit with enough heat that Vander Weide’s pass was headed out of bounds. 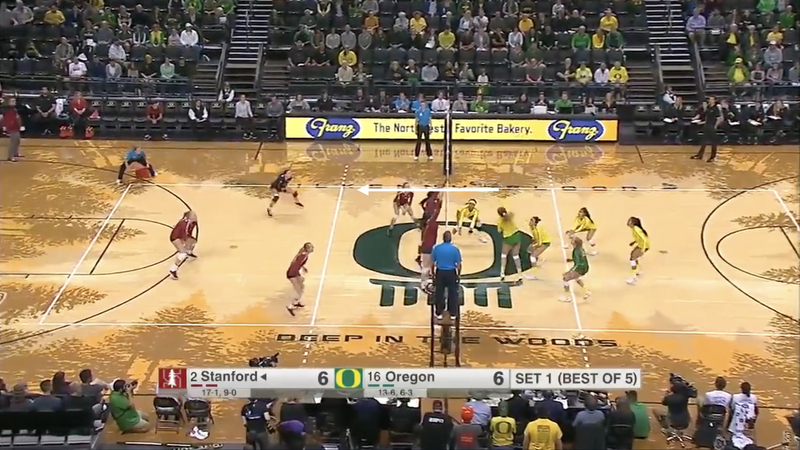 Oregon saved the ball but it resulted in a free pass to Stanford, which normally would result in a kill. The timing/set location from Gray was off. Can’t tell if it was too high to Campbell in the middle or that McClure didn’t know it was coming to her. Campbell takes a swing and a miss. This was ugly. Play 18 | Service error. A gift to Stanford. 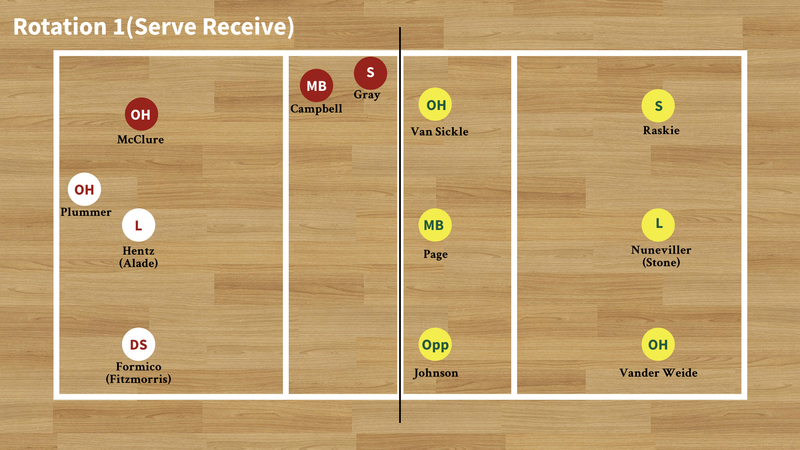 This rotation was another breakdown in defense, allowing Oregon to score two points off their serve. Play 19| Formico’s good serve gets Stanford a free ball. Gray tries to hammer it but Oregon’s defense is there. After some scrambling on both sides, McClure is able to finesse a shot over on the left side. At this point, things are close. With the score 9-11, that two-point margin is enough for an Oregon win if they can maintain it (first team to 25, must win by two). But there is plenty of time for Stanford to score a point or two on their serve. However, the game will be lost with the next rotation. 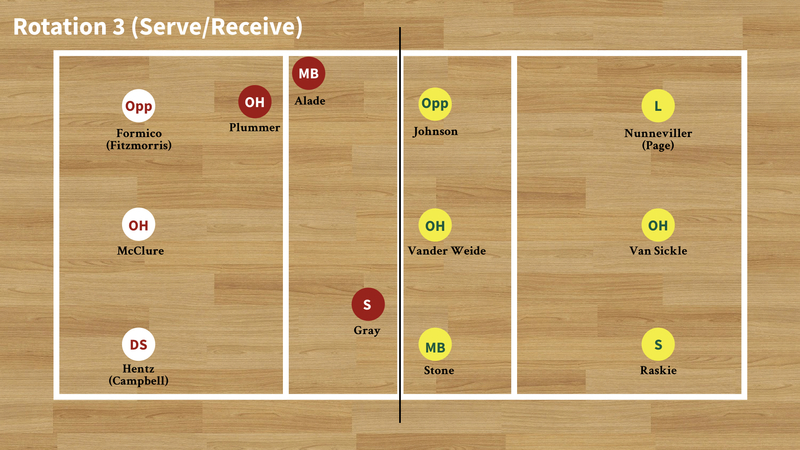 With Stanford back in Rotation 1 (Serve Receive), Oregon will score four points in a row. 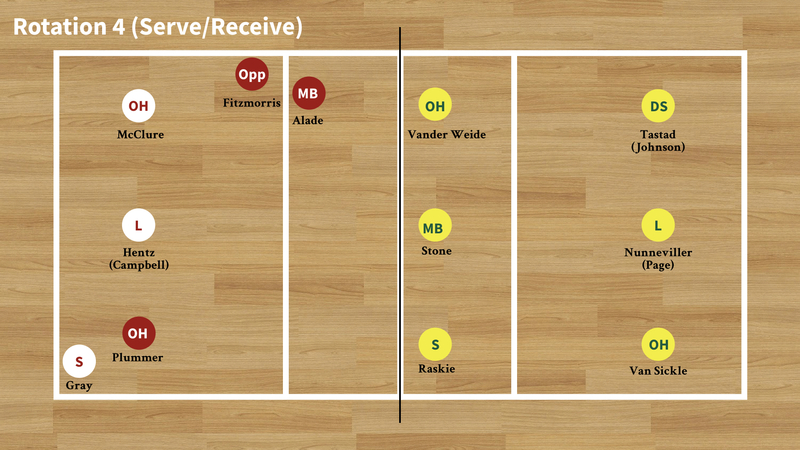 This rotation may have Stanford’s strongest serve reception team (McClure, Hentz, and Formico are all excellent) but there were four costly mistakes in a row. A bad serve reception forced a bad set which forced an attack error by McClure. That was followed by another attack error by McClure. A back row attack from Plummer went long. And, finally, McClure had another attack error before Campbell could score on a slide and Stanford could get out of this rotation. For the second set, both coaches spun the dial of their respective rotations. Stanford began in its fifth rotation while Oregon chose to start in its third. On the service side, things didn’t improve from set one (Stanford lost eleven points on serve, versus nine in the first set). 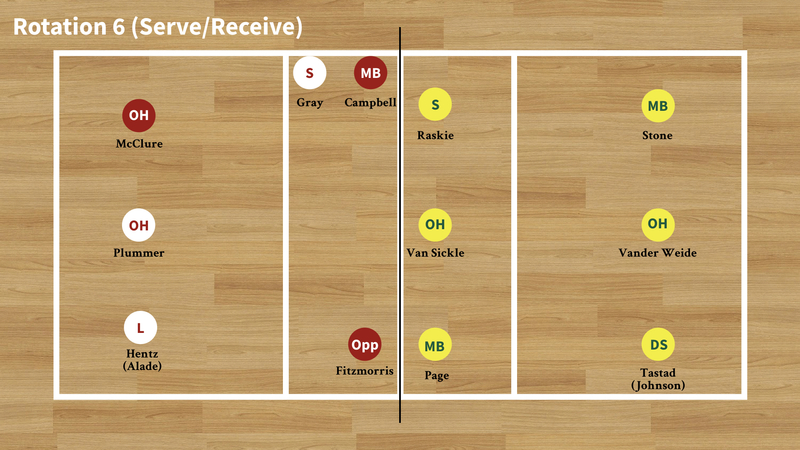 But Formico and McClure each had an ace and the service game by both Wilson and Gray gave us a number of points. It was in serve receive where the game was won. Not only did things not break down this set, but Stanford was nearly flawless. In the second set, Oregon scored just three times on its serve (versus 13 in the first). Stanford scored seven times on its service. Oregon sort of fell apart in sets three and four, which Stanford won 25-17 and 25-15, respectively. There was one moment in the third set where the Oregon coach, Matt Ulmer, uncorked on a couple of his players during a time out. I couldn’t hear what he was saying, but you could tell the communication was direct, pointed, and intense. It was interesting to hear him speak before and, then, after the game. There appear to be some difficult team dynamics going on. Recently, a number of key players were suspended for a match for violating team rules on a road trip. Road wins feel good. Since this Oregon victory, Stanford has had two others, over USC and UCLA. They are now 12-0 in the Pac-12. Washington St., USC, and Oregon are tied for second place four games back with 8-4 records in conference play. For Stanford, it’s not enough to win the Pac-12, though. Their goal is to earn a top-four ranking going into the post-season tournament, as the top-four teams have a significant home-court advantage through most of the rounds of the tournament.